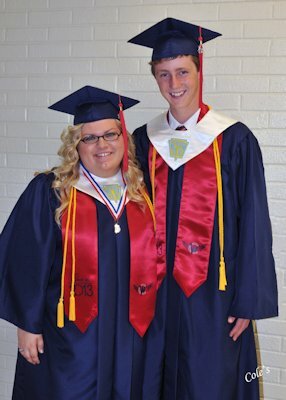 West Central High School Salutatorian was Abby Hubbard and Valedictorian was Evan Bell. They were also recognized with the prestigious Academic Excellence Award for achieving a 4.0 grade point average for the 2012-2013 school year. Abby is the daughter of Mr. and Mrs. Brian (Pam) Hubbard of Stronghurst, and Evan is the son of Ms. Julie Meloan Bell of Oquawka and Mr. Brian Bell of Michigan City, Indiana.